Stoughton senior Delaney Nagel has been selected as the HockomockSports.com Player of the Week, presented by Morse Insurance, for Oct. 21 through Oct. 27. Nagel is the eighth player chosen as Player of the Week for the 2018-19 school year. 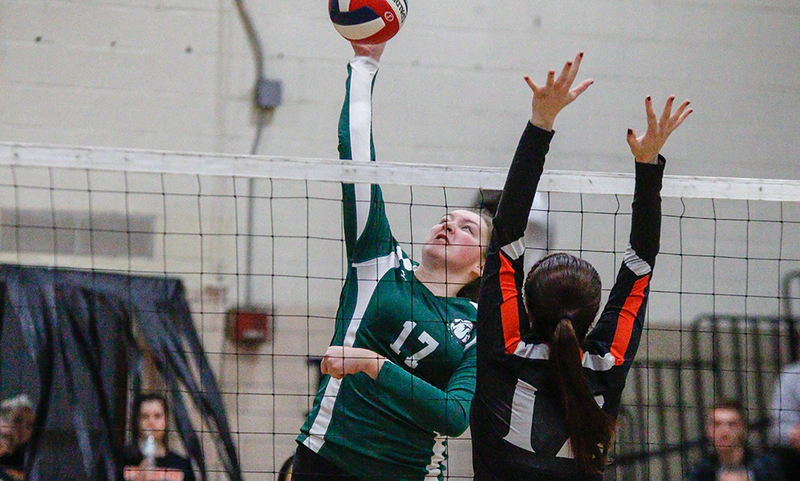 Nagel, a middle hitter for the Black Knights, had a big all-around week to help Stoughton finish up the regular season with three wins, finishing just one game back of Canton in the league title race and with 15 wins overall. 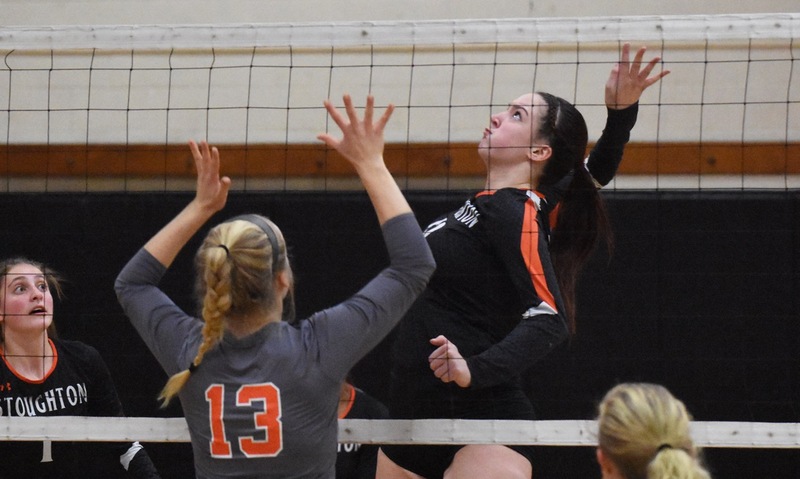 Nagel was influential at the net on offense and defense and at the service line to extend Stoughton’s win streak to five games heading into the postseason. Nagel opened the week with an impressive performance at the service line in the decisive fifth set against division rival Milford. She had seven aces in the final set alone to lift the Black Knights to the win. 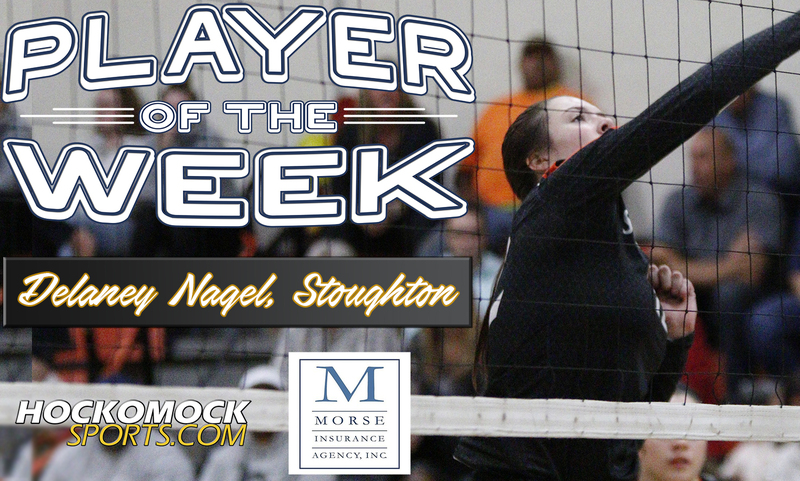 Two days later, Nagel had a strong game at the net, with 14 kills and 10 blocks, to help Stoughton overcome a first-set loss to Sharon and win 3-1. She wrapped up the week on Friday, combining with Molly Turner for 23 kills in a sweep of Cardinal Spellman. For the season, Nagel is tied for the most blocks in the Hockomock League with 80 (along with Canton’s Erin Devine). She is also third on the team with 125 kills. Canton @ Braintree – Postponed to Monday, 10/15. Oliver Ames @ Taunton – Postponed to TBD. Franklin, 2 @ King Philip, 3 – Final – King Philip built a 2-0 lead by halftime but had to hold off a rally from Franklin to earn the win on a rainy afternoon. Alli Meehan scored twice in the first half, the first set up by Meghan MacDonald in the sixth minute and the second assisted by Abby Nixon with 16:59 left in the half. Franklin’s Ashley Reutlinger opened the scoring in the second half to get within one but MacDonald (assisted by Paige Berdos) answered for KP. Victoria Quinn scored Franklin’s second goal with an assist from Amanda Lewandowski. Makenzie Manning made 11 saves in net for KP while Anna Jardine made eight stops for Franklin. Kate O’Rourke had an outstanding performance defensively for the Panthers. Attleboro @ Mansfield – Postponed to TBD. Canton @ Foxboro – Postponed to Friday, 10/12 at Forekicks Taunton. Milford @ Sharon – Postponed to TBD. Stoughton @ North Attleboro – Postponed to TBD. Oliver Ames @ Taunton – Postponed to Friday, 10/12. Attleboro, 0 @ Mansfield, 3 – Final – Mansfield defended home court with a 3-0 sweep (25-15, 25-17, 25-14). Greenly Kelly had 11 kills and eight service points, Emily Dardinski had eight kills, and Abby Sullivan added 12 service points for the Hornets. Canton, 3 @ Foxboro, 0 – Final – The Bulldogs had a strong team performance, leading to a 3-0 win on the road at Foxboro (25-12, 25-13, 25-10). For Canton, Julia Minichiello had a great day with 13 digs and three aces. Ally Irons, Emily Morrison, and Bella Touzos played good defense, Sydney Gallery, Nyah Claiborne and Liz Bickett were strong at the net, and Jackie Morrissey distributed the ball well. Franklin, 3 @ King Philip, 0 – Final – Click here for a recap and photo gallery of this game. North Attleboro, 1 @ Stoughton, 3 – Final – Stoughton took the first two sets and finished the game with a win in the third set to pick up the victory over the visiting Rocketeers (25-18, 25-13, 20-25, 25-17). For Stoughton, Delaney Nagel was strong at the net with 11 kills and six blocks while Molly Turner played impeccable behind the line with 16 kills and a total of 25 service points. Oliver Ames, 3 @ Taunton, 0 – Final – Oliver Ames won a marathon of a third set to complete the sweep at Taunton (25-23, 25-5, 32-30). Jordan Bennett had a strong game defensively for the Tigers, Sadie Homer had 38 digs, Allie Kemp added 28 assists, Caitlin Cavanaugh had 16 kills, and Grace McCallum chipped in with 12 digs and three aces. Attleboro @ Foxboro – Postponed to TBD. Oliver Ames @ Mansfield – Postponed to TBD. Milford, 180 vs. Nipmuc 187 – Final – Justin Applebee led the way for the Hawks with a low round of 43 and Alex Klosen shot a round of 45. Sharon @ Taunton – Postponed to TBD. Stoughton @ Canton – Postponed to Wednesday, 10/17.